Since I have been getting back into comic books, I thought I would start a new feature called Comic Haul! This first feature is about my haul from a comic convention I attended last weekend. Check it out! This past weekend I attended a semi-local comic book convention in Cape Girardeau Missouri. The Cape Comic Con has been going on for several years now, and it just seems to grow and grow each year. I have attended the con for at least the past six years with my great friend Dan Brown [Twitter | Blog] and we always find lots of treasure and have lots of fun. Our local comic shop Campus Comics had a table set up there, so we chatted with the owner Mike Noe for a while in between browsing the other vendors. If you're ever in the Southern Illinois area, be sure to check out Campus Comics in Carbondale! Dan and I have been helping sort back issues there on Saturdays and we have uncovered all kinds of great stuff. From this point going forward, when I say "My Comic Shop" I'm not talking about my local store. I'm actually referring to mycomicshop.com where I do 100% of my online ordering. Try them out if you haven't already! You won't be disappointed. 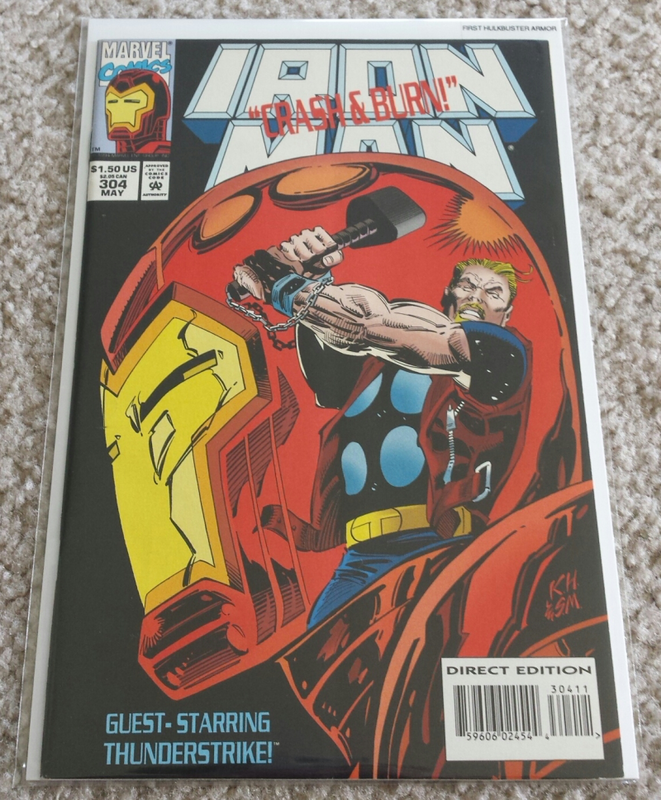 I picked up Iron Man #304, which is the first appearance of Hulkbuster armor Iron Man. My Comic Shop lists it as $18 to $29, I paid $25 for it. The vendor that had the book had two copies, and I picked the one I felt was in better condition. This is an issue that I have been wanting for a while. I really like the Hulkbuster armor and I felt like this is a key issue I should have in my collection. 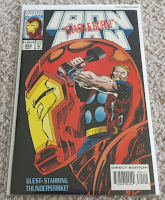 I have also recently bought the first appearances of the stealth armor and the silver centurion armor. 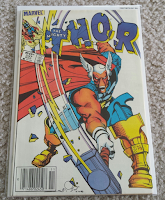 I also picked up The Mighty Thor #337 from another vendor. Thor #337 is the first appearance of oddball character Beta Ray Bill. The character has always intrigued me and when I first saw him I didn't have any idea what I was looking at. This is a key issue and an iconic cover, so I was very happy to pay the asking price of $40 for it. $40 is slightly higher than it goes for on My Comic Shop, but I didn't mind paying the extra $5 or so for it to get it right then. 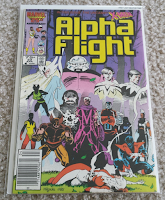 From another vendor I picked up Alpha Flight #33, the first appearance of Lady Deathstrike, for $1. I bought several comics from him for $1 each, but I feel like this one is worth a little more. It's a key issue in that it's a first appearance, but it doesn't seem to be worth anything. In any case, I wanted it, and the price was certainly right! 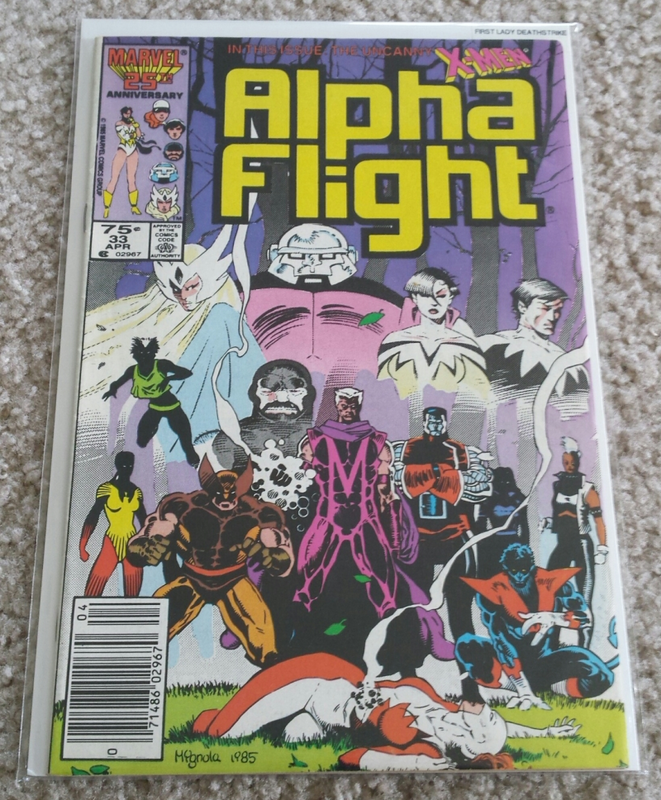 Fact: Volume 1 of Alpha Flight went on for 130 issues from 1983 to 1994. Of those 130 issues, this is probably the most valuable issue and it's still worth less than $20. It's actually probably not even worth $15, but still. Alpha Flight, everybody! I have recently been trying to collect issues in what My Comic Shop refers to as Rogue's hero journey. 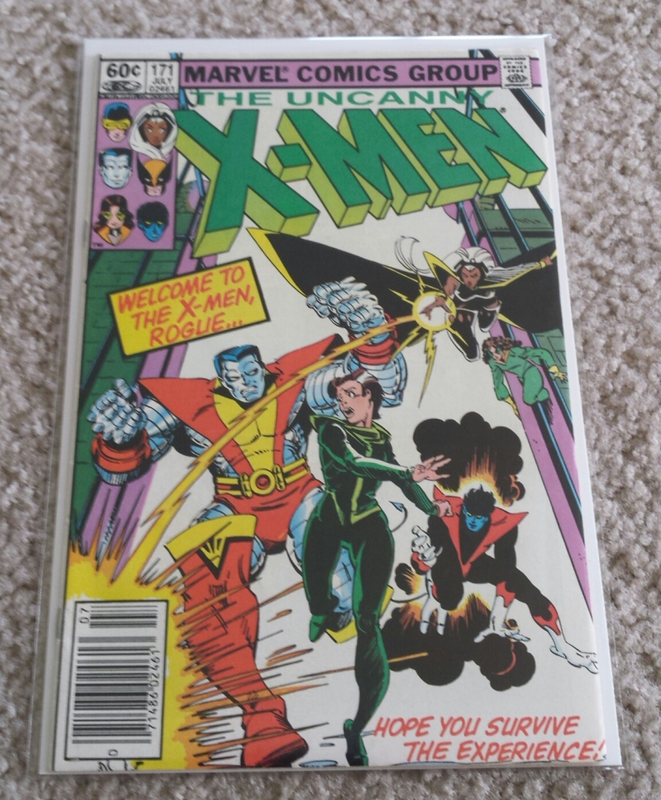 I picked up Uncanny X-Men #171 which is part 7 in the story. Basically this is just referring to the early issues that introduce Rogue as a villain and the following issues that show her slowly becoming a hero. 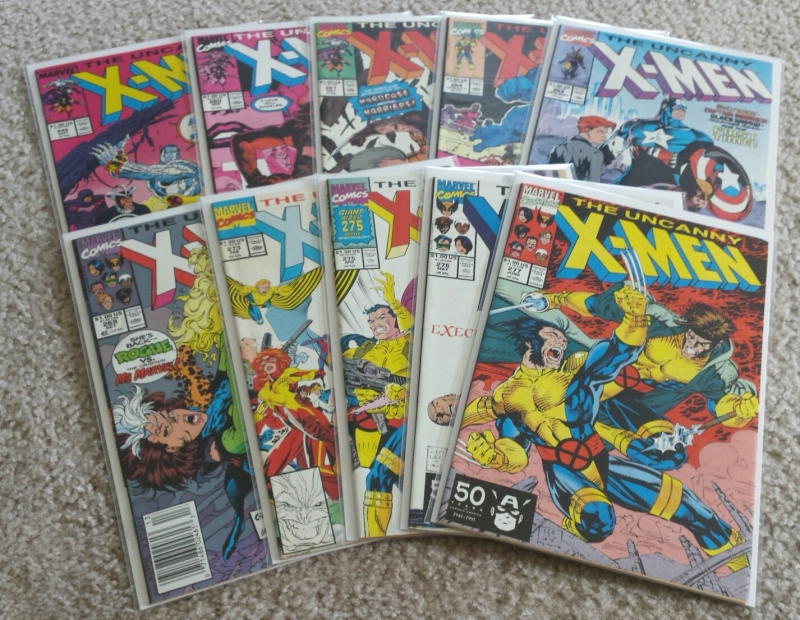 I picked up a few other issues in this arc as well, but the Uncanny X-Men #171 was the priciest one at $10. I have a few more issues from this set coming to me in the mail and they should be here within the next few days. 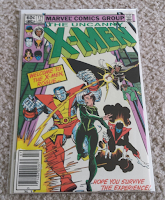 Keeping up with buying first appearances and issues of historical significance (not to mention my love of 90s comic books) I decided to start picking up the Jim Lee X-Men books, so I found a few issues of Uncanny X-Men that he did the cover or interior art for. 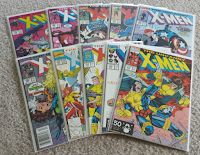 Jim Lee was very important to X-Men when it was rising in popularity during the mid-90s, so these issues, while not worth that much, are still historically important. Most of the issues I picked up in this run were $1, but #248 was $6 and #268 was $20. My Comic Shop lists #248 for a minimum of $11, topping out at $27, so I think I did pretty good on that one. #268 was priced pretty accurate. 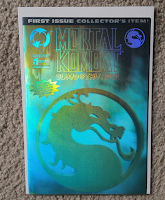 Finally, the most 90s thing I bought this trip was a hologram cover issue of Mortal Kombat: Blood & Thunder. 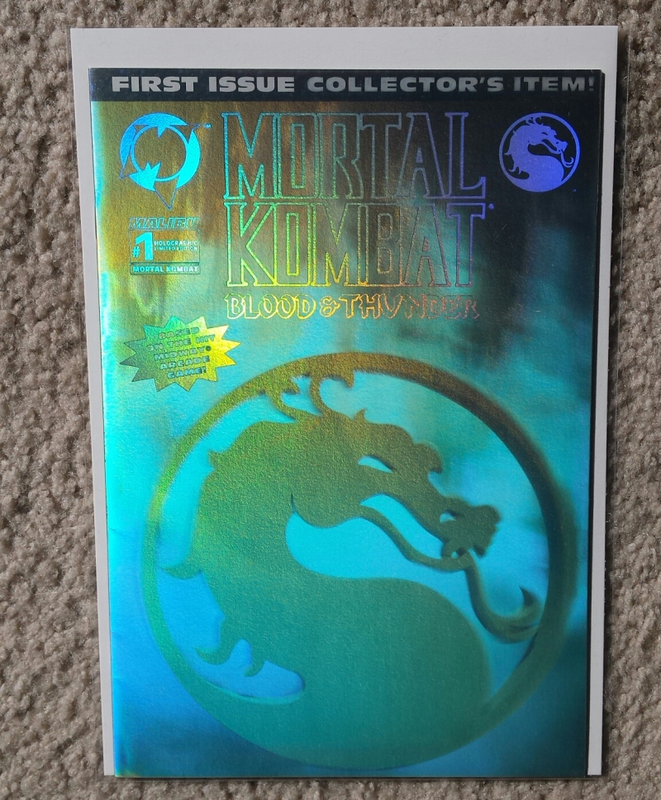 Nothing says the 90s like holograms and Mortal Kombat, am I right? This comic ran me $20, but it was really speaking to me. Normally I wouldn't pay that much for a gimmick 90s cover, but this one was just so beautiful. I fully expected to see countless copies of 90s staples like Tribe and Shaman's Tears there, the latter especially since Mike Grell himself was at the con. Oddly enough, no Tears were shed on that day. Overall, it was a very successful haul!